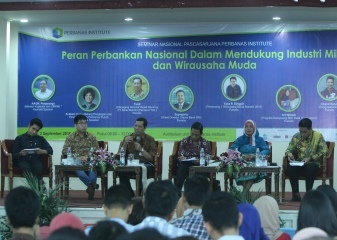 On 3rd September 2016, Perbanas Institute hosted a seminar on micro-entrepreneurship which aimed to highlight the strategic role of Indonesia’s banking industry as well as budding entrepreneurs in the development and expansion of local SMEs in the country. The event was attended by prominent local SME owners, academics, students, in addition to representatives from state-owned and private banks. Furthermore, Perbanas also invited young entrepreneurs to provide insights to the university’s enrolled students regarding the importance of young business leaders whose products and services can make a difference in Indonesia. Deputy for Institutional Affairs of the Ministry of Cooperative and SMEs Mr Choirul Djamhari, Ph.D and Dr Aviliani as Head of Assessment and Development Centre for the Association of Banks also attended the event. Both speakers were also joined by Mr Arief Surarso, Vice President of Small Business Division at Bank BNI, Mr Tardi as Director of Retail Banking at Bank Mandiri, as well as Mr Yasa Singgih, Mr Chand Kelvin and Ms Sri Winarti — young entrepreneurs who shared in-depth information into their recent business success. The seminar sought to showcase the government’s efforts in developing the SME sector through business mentoring programmes and SME lending initiatives, whilst also encouraging the entrepreneurial drive amongst the country’s youth. In organising this latest seminar, Perbanas Institute aims to showcase the importance of advancing Indonesia’s SME sector in order to encourage the next generation of innovative and creative entrepreneurs. As Indonesia’s leading higher education institute for banking and finance, Perbanas Institute continues to undertake a number of measures to enable its graduates to contribute to Indonesian SMEs competitiveness on a global scale.